Strategies, Strategies and More Strategies! It’s Absolutely Practical and Now 100% Guaranteed! That’s right. It’s time to end boring classes and disengaged students. You can now have exciting classes, with students who think, process, raise their hands, contribute and interact. I’ll give you two ways to become the hands-up favorite for most “engaging teacher” who has the most fun and most successful students on campus. My first job out of college was teaching. I was (and still am) very passionate about teaching and learning. But that was my only saving grace. As a new teacher, I simply did not have the skills, attitude or strategy to engage my students consistently. I shudder to think of how many students were bored in my classes. And here’s the worse part: I used to blame them for not being motivated! Today, participants tell me that Jensen learning presentations are among the most compelling, engaging they have ever experienced. But it was not always that way. 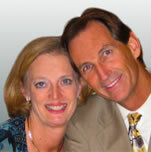 You may know me (Eric Jensen) as the leader in the brain-based movement. After all, I have written 26 books on the brain and learning including the best-selling educational brain book of all-time, Teaching with the Brain in Mind. Discover the amazing magic that’s been bottled up inside you for your all your professional life! Enjoy the most engaging professional development week and reap confidence for a lifetime! You can learn how to captivate, involve, include and activate every learner, so they get it right every time. Learn to differentiate your presentation to meet the needs of ALL students. Discover time-tested, research-driven results to positively impact your students. Join world-renowned trainer and brain-based leader Eric Jensen for a lifetime of “Teacher Toolbox” strategies in one fun-filled week! There’s a reason we call the workshop the “Golden Toolbox” ... have you checked the world value placed on gold lately? 1. Toolbox for cognitive engagement. 2. Toolbox for “Knock your socks off” Emotional Engagement. How do you engage the reluctant learner? How do you help almost any student to invest in what you're teaching? Learn how to engage your audience, as well as how to lead them into activities and processes for higher learning. Discover the chemicals in the body that make us feel the way we do. Learn the specific strategies that a presenter can use to alter and manage the energy levels of their audience. Here we dig into the emotional side of engagement like no else can do! 3. Toolbox for the Climate For “Engagement” Conditions. Learn how to create the climate for engagement. Learn how to optimize engaged learning environments. Learn how to establish a safe classroom environment where students feel free to make mistakes and contribute. Without this climate, students won't take the risks they need to grow. The stronger your "safety net" is, the more you will be willing to risk new behaviors. 4. Toolbox for Front of the Room Skills. You’ll get Critical Presentation Tools – Learn the number one critical presentation skill and get good at it (with our help!). With it, you’ll always have a great day at work. These are the inside secrets from the pro that has trained the trainers worldwide. Some strategies are the insider ones never revealed that help you get the engagement you need. These powerful strategies that work like magic and students will have more fun with them, too. Learn the secrets to presenting your subject like a pro, so your students really learn. Attract, engross, and captivate your students! Smarter lesson planning gives you a better chance at higher achievement. 5. Toolbox for Physical Engagement. Learn how do you get the student out of their seats to move and participate. Discover what stops participation and what launches it into high gear. 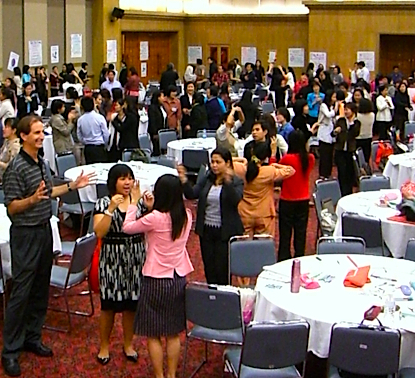 You’ll learn energizers for sitting, standing, for moving, for teams, for pairs and for the whole group. You’ll learn ways to build activity and excitement. Learn how to change the brain’s chemistry with simple activities that make your life a day at the beach! Summary: In this workshop, you will gain priceless teaching skills, grow, and develop self-confidence and key insights to make your job easier! Plus, you will also receive daily practice and a wealth of feedback and collegial support. Who should take this specialized, cutting-edge training? Those who get the most value out of it are most often: 1) trainers who work with groups of 20 or more 2) staff developers who really want to make a difference in the lives of others and 3) teachers who want a more energizing classroom 4) anyone who currently or will in the future, spend a lot time in front of groups. This is the most valuable workshop that you will probably ever attend! Lillian Arleque--Andover, MA. Learn these essential skills and dozens of other cutting-edge strategies and you can virtually guarantee your presentation success. You've already heard about the brain's neurotransmitters like dopamine and serotonin. You've heard about hormones like adrenaline and testosterone. But did you know that you could influence their levels in your participants? That's right--the way you train can change the chemistry of your audience's brains! And you'll learn how to do it in this amazing 5-day trainer's delight. Nobody else can show you how like I can. Training with the brain in mind--what a concept! you’re getting the most relevant program possible. Here’s why you ought to make it your job to engage your students: Learning is both the package and the process! Your role as an instructor is to facilitate learning and you cannot separate the content of what you offer from the social environment it is offered within. They form a complex, unified “package” that is delivered to the learning brain. If you send a package through the mail, what is the most important part of the process? The answer is that the package and the delivery process are essential; one is useless without the other. Is the role of a mail carrier (or computer server) to travel all the routes just to meet the customers? Not without delivering the package, too! Unless the delivery process is good, the content of the package will not be received by the customer. Is the role of a mail service just to pick up packages and take your money for them? No, it still has to deliver them. Neither the process nor package is valuable in itself. A presenter may deliver content, but unless the learning process is completed, the package is wasted. How much of a one-hour lecture do you think the average audience member could remember, share and teach to a partner? The answer is that most audiences would be hard-pressed to remember more than five minutes (or about eight and a half percent of the lecture). Of those few minutes, it’s questionable how much of would be dead-on accurate. Remember, while creating content is the mandated part of your job, the process of ensuring delivery is just as important. Engagement is a must. You need the “Tools for Engagement” to succeed. learn to hook in learner’s optimal focus state of “well-being” by enhancing the primordial “flow” state with serotonin! Today are over 31,000 neuroscientists worldwide. Of those, approximately 6% or 1,860 study the brain’s chemistry. Of those, less than 30 in the world actually investigate the practical applications that you and I could use in our daily work. And while most scientists don’t actually “connect the dots” linking neuroscience and your work in a classroom, I do see connections—powerful ones. And you will too with these tools! I also co-founded the first brain-compatible academic program in 1982, founded the first on-line brain-based educator newsletter, the first annual brain-based EXPO and annually I train in-depth more folks on the brain than anyone in the world. What you’ll be getting cannot be found anywhere else in the world. You’ll be getting the “key” to the “brain’s vault” for influencing human behavior. But take advantage of this offer soon, while supplies last! With this “Fort Knox” of nearly “magic” strategies, you’ll be busy for years. How do I know this? Because I have been studiously adding these tools (just one at a time) to my own presentations for the last seven months. Each one takes a bit of time to get it down pat and to feel comfortable using—like any other skill. You gotta see it, hear it and experience it to believe it! Now imagine the new possibilities: your school is succeeding and you feel the joy that comes with being highly engaging. You are about to hear your kids talk about how much they love school. Wouldn’t that make your day? It’s time now. Time to stop wishing and time to get started. Don't miss our amazing and original brain-based teaching and training workshops for teachers, trainers and administrators. Click Here For Details On Brain-Based Learning Workshops. Boost Student Learning & Achievement. 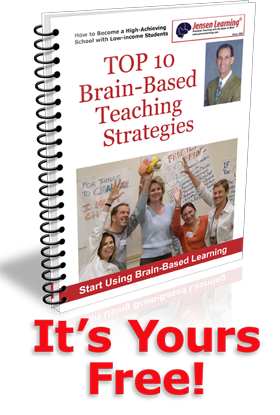 Brain-Based Teaching Strategies For The Learning Brain. Every event is fun-filled, action-packed and guaranteed to give you usable, fresh strategies that you can use in your teaching arsenal for years. Plus, you get the genuine research that supports every single innovative, easy-to-use teaching idea that you can put into effect immediately. Eric Jensen’s topics focus on practical strategies linking brain research to student achievement. At conferences, Eric Jensen typically does keynotes and breakout sessions. In addition, Eric is available to offer much longer, more in-depth programs at your school or district. Each additional day gives your participants a stronger scientific foundation plus additional practical strategies, with time to practice on-site. Workshop Hotel and Travel Details | Brain-Based Learning | Teacher Lesson Plans | ©2014 Jensen Learning Corporation. All rights reserved.